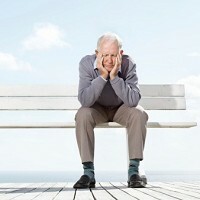 One in three over-fifties and nearly half of people over the age of 80 feel lonely, research has revealed. And figures from the Office for National Statistics (ONS) show women are more likely to feel isolated than men. Laura Ferguson, director of the Campaign to End Loneliness, said the danger of loneliness should not be underestimated. She said older people were more at risk of becoming lonely as they were more likely to suffer from a bereavement and problems with illness and mobility may make it more difficult for them to have an active social life. Michelle Mitchell, charity director-general at Age UK, said local authority cutbacks were likely to make things worse as support services were reduced or scrapped. She said people should be good friends and neighbours by making time for the elderly and checking they are okay. Older people may find travelling to visit family and friends will help ease their feelings of loneliness, with deals offering travel insurance to people over 65 available.